Chris O'Dowd was born and raised in Boyle, County Roscommon. He is has found international fame as an actor on stage and on screen with leading roles in the now iconic TV Series The IT Crowd, and films such as Bridesmaids and Calvary. Chris was also nominated for a Tony Award for his role as Lennie Small in the Broadway revival of John Steinbeck's classic novel 'Of Mice and Men'. Chris now divides his time between LA and London, with his Journalist and Presenter Wife, Dawn O'Porter. They have two children together. 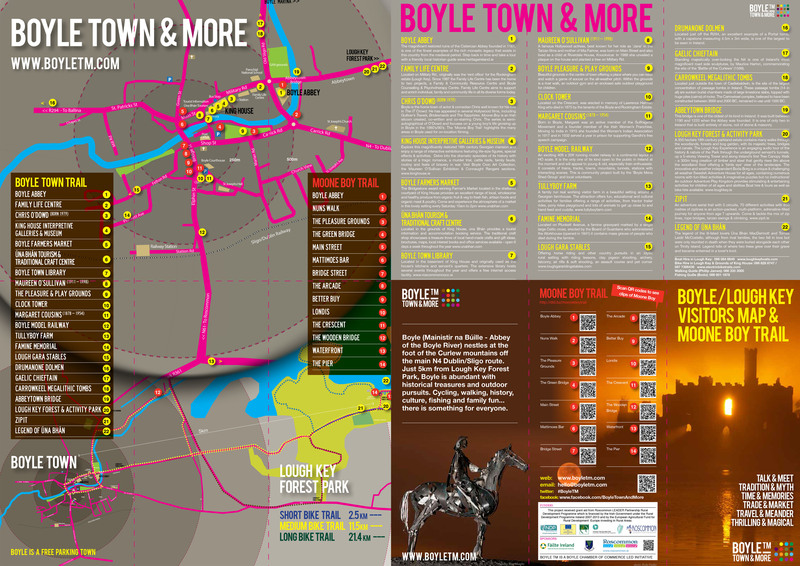 The Moone Boy Trail is an interactive walking/cycling trail which takes you through the various locations where on-site filming for Moone Boy took place throughout Boyle. The Trail is accompanied with a FREE brochure pinpointing the various locations where filming took place, including QR Codes. QR codes can be scanned by using your mobile phone or Tablet (QR code scanning App must be installed on your phone or tablet) to show you edited footage of the Moone Boy series which is unique to each location. Full map available here and in-store. Boyle, Co. Roscommon is the proud home of the Emmy Award winning TV series, Moone Boy. Boyle native and Hollywood star Chris O'Dowd co-wrote the series with Nick V. Murphy. Moone Boy brings you on an hilarious autobiographical journey of Chris's life as a young teenage boy in Boyle. Paul is co-founder of Cartoon Saloon and is an Oscar and Bafta nominee. He collaborated with fellow Boyle native Chris O'Dowd as the illustrator for both the Moone Boy TV Series and books. Paul's company The Cartoon Saloon is now an internationally recognised illustration company. He produced the animated features such as 'The Secret of Kells' and 'Song of the Sea'. He is currently in production of The Breadwinner, directed by Saloon Partner Nora Twomey and Executively produced by Angelina Jolie Pitt. Fans of Moone Boy can purchase many of the iconic merchandise through Úna Bhán Tourism's online shop or in-store.